I remember my first musicianship lab, an often tedious requirement in the Music Department that accompanies any introductory music theory course at UCSC. When my roommate and I got to class, our TA, Nick, was zoned out, staring off at the wall, and effortlessly conjuring one obscure chord after another. I’d always loved music, and had a relatively easy time absorbing the mathematics of western notation, but the one thing that frightened me most was the idea of sight-singing, or, more colloquially, reading a melody off a piece of paper and singing it in front of the class. In any case, our TA snapped out of his trance and instantly engaged every student in the room. He started us off on our first sight-singing exercises and, after abiding the first round of atonal moaning, encouraged us to loosen up and sing out like we were by ourselves in the car. This teaching assistant’s lab made the material and exercises more palatable than the professor who taught the corresponding lecture. The introductory theory series provides students with a background in musical theory. Students then progress through the core theory curriculum, where they learn more complex scale and chord constructions. These classes include Music 13 and 14, and the consecutive year-long 30 and 100 series. Though I didn’t pursue formal education in music, I stayed in touch with my TA and eventually came to discover his work as renowned composer Nick Vasallo. He gave his master’s recital in composition at UCSC in April and remains a vital source in my informal musical training. Early Spring quarter, it became apparent that cuts were being enacted in the Music Department, and that the Music 60 group piano lab was not going to be offered for the term. Labs like Music 60 essentially force majors in the program to learn how to play the keyboard, a fundamental skill in the recitation and composition of music that implements rigid pacing and evaluation. The cut came suddenly, with virtually no warning, and even for students and staff within the department, the lack of transparency surrounding the cut has, until recently, made it difficult to determine whether other parts of the Music Department are on the chopping block and how long such cost-cutting strategies will remain in place. State funding for the UC system is first routed to the University Office of the President, then to the administrations at each of the 10 UC campuses. From there, it’s sectioned off to the divisions and later to the different departments at UCSC. Each tier of the funding structure has a relative level of autonomy with respect to budgeting, and it’s here that the music department has come into some difficulties in recent years. In 2004, the Arts Department was informed by senior administrators that cuts would be enacted, and word came down to the Music Department that spending on merit raises for continuing staff and lecturers would have to be put on hold. Nauert explained that a music program needs additional funding to effectively teach the material, and that the department’s success is contingent on being able to provide “applied instruction,” or one-on-one lessons to every student in the program, specific to their chosen instrument. These sessions are mandatory to ensure the student is ready for advisory evaluations by the faculty upon declaration of the major. Later, their progress is monitored in proficiency exams. A by-product of recent spending cuts across campus, the Music Department has been forced to increase the quarterly fee for a student enrolled in applied instruction from roughly $150 to $415. Past attempts by the department to more gradually increase the fees, citing the limitation of access for disadvantaged students, have been repeatedly quashed by the upper administration. Offerings for the Music 13 and 14 introductory theory courses have also decreased. Music 13 and 14 were offered during the summer session. Nauert said in an email that these offerings were meant to accommodate students who needed to take the courses but couldn’t secure a spot in them during the academic year. He did not address the issues facing those students financially incapable of attending summer session, however. Addressing the group piano labs, Nauert cited triage as the reasoning behind “significantly cutting back” their availability. He said that the expectation is that the similar piano instruction offered in the Music 30 and 100 series would offset the absence of the labs. Without denying the need to curb costs at every level, Andy Warren, a UCSC alum, said that cutting piano instruction trivializes one of the most important parts of learning to play and create music. Tenure track, or “pay to ladder” faculty, are not affected by the music department reductions since their pay scale is determined by permanent academic funding from the central administration. Staff and lecturer budgets, however, are seen as more expendable and the temporary funding that has typically padded these peripheral salary increases based on merit has dried up. According to David Evan Jones, the acting dean of the Music department, in addition to the department’s reduced 2009-2010 academic year budget, it is also expected to sustain $583,000 in cuts in coming years. That cut equates to roughly five percent of the department’s total operating budget, meaning that course assignments for some lecturers and other non-tenured faculty have been cut. “At this time, the classical music minor has been eliminated, and the department is considering whether or not it will be able to continue the electronic and jazz minors,” Jones said. Until specifics about next year’s cuts are released, no firm determination about the state of the jazz and electronic music minors can be made. Regardless, Jones laments the uncertain future of the programs, remembering his own involvement in the design of the electronic music minor alongside fellow professor Peter Elsea. With respect to what’s being done to minimize the impact of courses being dropped, Elsea explained that various alternatives to satisfy different departmental requirements have sprouted up. “Students have been quite creative in finding alternatives,” Elsea said. Music major Alex Talan thinks that what makes the electronic music program unique is its facilities, most notable of which are the electronic music studios run by Elsea since 1980. The announcement of funding cuts to things like the studios, and concordant reductions in course offerings, has ushered in an onslaught of opinions from students. Mamelok argues that the department isn’t geared toward inexperienced musicians in the first place, citing his own difficulties with the pacing of his upright bass lessons. 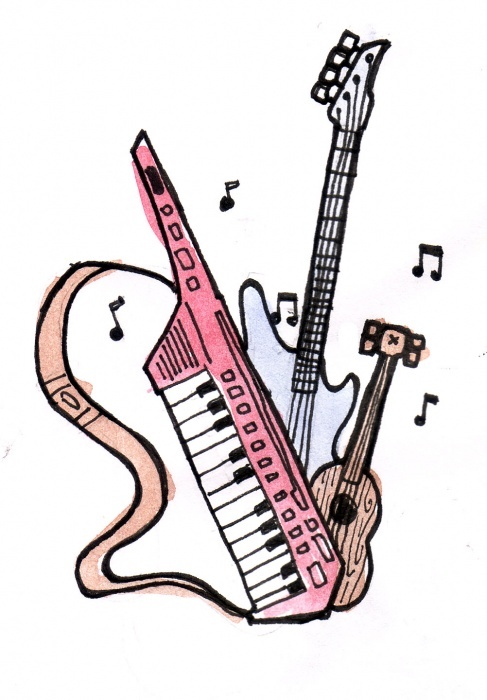 Vasallo, my T.A., insists the introductory courses are essential to the music program maintaining a student-base since they provide a no-obligation forum for prospective students to experiment with the idea of becoming music majors. Regarding the budget cuts, he seems utterly dejected. “I understand cutting from the bottom, but education is the last place we need to be making cuts,” Vasallo said. For now, Vasallo will keep on teaching and hoping that the music won’t go silent at UCSC. “Watching my students discover relationships in theory is the best feeling,” he said, smiling, of his experience teaching Music 13 and14.